Lima, Peru will host the "4th World Congress of Biosphere Reserves" to gather over 1,300 experts and representatives of organizations involved in natural areas protection on March 14-17, 2016. The head of the National Service of Natural Protected Areas (Sernanp), Pedro Gamboa, considered this meeting an historic event not only for Peru, but for Latin America, since it is "the first time the meeting will be hosted in the region." 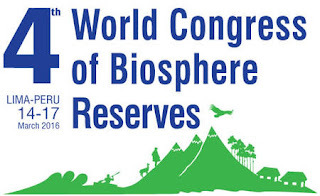 4th World Congress of Biosphere Reserves: A New Vision for the Decade 2016-2025. UNESCO Biosphere Reserves for Sustainable Development will involve all National Committees of UNESCO’s Man and the Biosphere (MAB) programme and experts directly involved in the practical implementation of biosphere reserves, including: representatives of governments, biosphere reserves, local communities, UN agencies, NGOs, academic institutions, and organizations and institutions from all over the world working with the MAB Programme. During the Congress, experts will discuss progress and obstacles related to biosphere reserve issues and work to develop a new vision for the future. Review of the implementation of the Madrid Action Plan for Biosphere Reserves 2008-2013, the Seville Strategy and the Statutory Framework of 1995. Assess the lessons learned and the new challenges to be faced by the World Network of Biosphere Reserves. Develop and launch an Action Plan for Biosphere Reserves for 2016-2025.